An unforgettable day with a professional English-speaking guide on the island of Capri, rich with natural beauty, scenery and history. 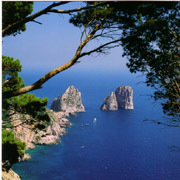 You'll have the chance to visit the town centers of Capri, Anacapri and the famous Blue Grotto. 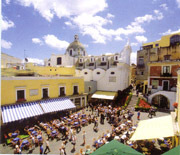 The meeting with the guide takes place down at the harbour of Sorrento (or Naples) or by Your hotel. After an introduction and a briefing, clients are taken to the jetfoil either the hydrofoil or the catamaran, that arrives on the island 20-25 minutes later (from Sorrento) or 45-50 minutes from Naples. Once there, starting from Marina Grande by boats which stop at the entrance of the cave, You will visit the Blue Grotto climbing aboard small rowing boats. Once back to the port, You’ll take a convertible taxi for driving along the most “panoramic road in Italy” as far as Anacapri. 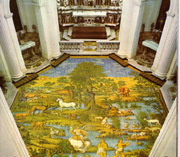 With your guide, Your will visit St. Michele Church. 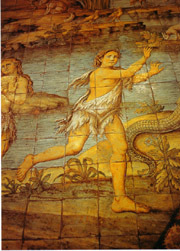 It has a beautiful pavement decorated with painted majolica tiles, this stunning floor painting depicts Adam and Eve in the earthly paradise, immersed in a surreal landscape, featuring imaginary and mythological animal forms such as the Unicorn. Free time for shopping, then a taxi will take You to Capri town, the other village of the island. There we will reserve for You the lunch in a prestigious restaurant, after which, with Your guide, You’ll walk to the Gardens of Augustus. Then other free time for exploring that village on Your own. For getting down to the port, You’ll take the cable-car and the guide will take You back to Sorrento (or Naples) by jetfoil (or catamaran). The guide will leave You at the harbour or by Your hotel.